Whether you’re travelling around the continent, or just want to get to know European culture a bit better, the cuisine can be a great place to start! Food within Europe differs from country to country, due to regional climate influence, however there are also many similarities. We’ve compiled some information about food all over Europe, so you can get to know the continent and its cuisine a little better! All of the Central European Countries have their own specialities. Austria is famous for Wiener Schnitzel, a slice of veal cutlet in a breadcrumb coating usually served with potato salad. The Czech Republic is known for its strong and great beers all over the world. Wurst (sausage) can be found everywhere in Germany and goulash in Hungary. Slovakia is best known for Halusky which is similar to gnocchi and Poland is famous for Pierogis. The Eastern European cuisine slightly differs from central European due to cultural and climate factors. In these countries they use meat, fish and vegetables for stuffing, frothing and puréeing. For example lamb, eggplant and bread are frequently used in Armenian cuisine. The Ukrainian cuisine is famous for Borshch: a vegetable soup which contains beets, cabbage, potatoes, tomatoes, onions and garlic. 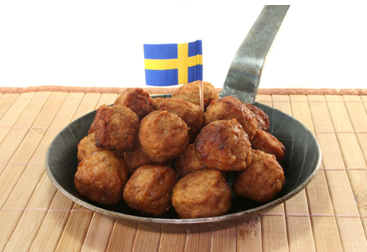 Most people have tried at least one type of Northern European Cuisine available at IKEA… Yes, the famous Swedish meatballs! Often served with potatoes and cranberry sauce. The English breakfast is also well-known around the globe which is made up of fried eggs, sausage, black pudding, bacon, mushroom, baked beans, hash browns, toast and tomato. Not to mention their tradition of afternoon tea. Most of the Balkan countries dominate the face of Southern European Cuisine. Bosnia is, for example, famous for cevapi, however, many other neighbouring countries eat this dish at a daily basis. Bulgaria is famous for its soup, Tarator, which is made of yoghurt, water, minced cucumber and seasoned with garlic. Italy is well-known for its cuisine all over the world. But, their pizza, pasta and lasagne is not like in the ones you’ll find in the USA or any other ‘Italian’ restaurants over the world. In Italy, the quality of food is like nowhere else! They’re food stands out because of their constant use of fresh and high quality ingredients. France is also very famous for its cuisine including their wide range of pastries, cheese and fondue. We can separate the French cuisine into two categories: nouvelle cuisine and haute cuisine. Nouvelle is the new cuisine, which is characterized by lighter, gourmet dishes and emphasis is on the presentation of the food. Haute cuisine is the classic, with an emphasis on gourmet experience and luxury. When traveling around Europe it is a great idea to try as many different dishes as you can, as there is such a wealth of great food available! From street food to gourmet restaurants, European travelling is sure to whet your appetite for more!